“There’s Something About Hookfoot” begins with the group still stranded on the island and fighting off a band of merpeople. Rapunzel chimes in with the narration that this is, in fact, a love story, and we flash back to Hookfoot staring into the sea. Eugene confronts him and discovers that there’s nothing wrong; in fact, Hookfoot is in love. Immediately everyone starts badgering him for the details, which he reluctantly divulges. He tells them about a mermaid named Serafina he met when exploring the beach. Serafina has asked Hookfoot out on a date, and Eugene and Rapunzel have very different ideas of how to prepare him. Rapunzel insists that he should be himself and speak from the heart, while Eugene proclaims himself an expert on dating and wants Hookfoot to focus on looking and acting the part. On the date, Rapunzel and Eugene continue to bicker, and they offend Serena by offering her roasted halibut. Rapunzel tells Hookfoot one more time to be himself and drags Eugene away. Hookfoot apologizes for trying too hard and gives Serafina kelp to eat. He tells her that he loves her, but in return, she offers a confession. The mermen from the beginning show up for Serafina, stating that she’s a wanted thief. She tells Hookfoot that it’s true. She also tells him that while she was using him as a patsy at first, she genuinely does love him now. They decide to escape together with a priceless pearl she stole, but their plan is short-lived. The mermen have captured all of Hookfoot’s friends, and, rather than risk everyone’s freedom, Serafina surrenders. They arrest her, taking her back into the sea. “There’s Something About Hookfoot” isn’t completely without merit, but it’s pretty close. 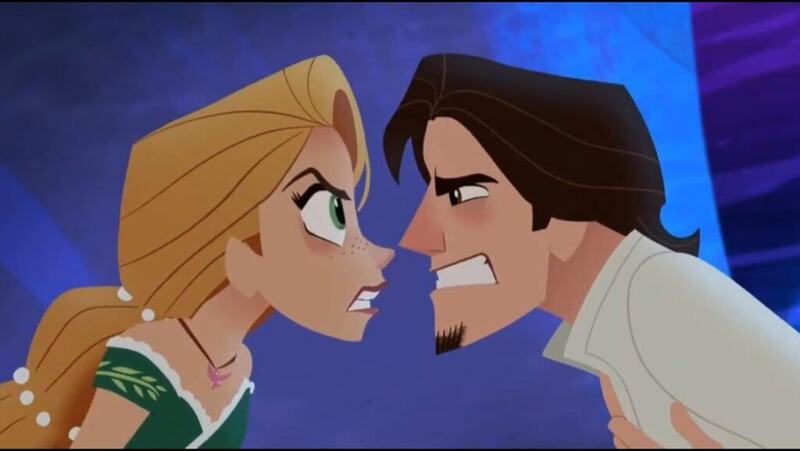 The conflict between Rapunzel and Eugene is childish and hard to believe. In Tangled, Eugene found someone who loves him for who he is, sans pseudonym and all other pretenses. So why would he then insist that Hookfoot needs to act as different from normal as possible to impress a girl? His statement that love is hard work rings true, but not in the way he means it. It’s annoying, petulant, and very out of character, especially in the way he treats Rapunzel when she disagrees with him on the subject. Her behavior is annoying at times too, such as her song during the date where she keeps saying random bits of advice, but at least her point of view is a little more reasonable. Cassandra does and says very little in There’s Something About Hookfoot,” and I’m of two minds about that. As everyone knows, I do not like this character at all. I like her design and the idea of giving Rapunzel a human, female friend/character foil, but Cassandra is extremely mean, abrasive, competitive and infantile. Several episodes this season have treated her as something of a non-entity, which is good in the sense that she gets fewer opportunities to be irritating and mistreat Rapunzel and the other friends. But it also begs the question, why is she even here? She had a more proactive role in season one, and even had a character arc where she and Eugene became friends and gained a mutual understanding. But this year they’re ignoring all that character growth and regressing her to her worst state (at the beginning of season one) in the episodes where she does have a significant part and ignoring her in others. This character is emblematic of everything wrong with this series: the writers don’t know what to do or don’t care at this point, so she alternates between being an annoying main character and a useless background character. 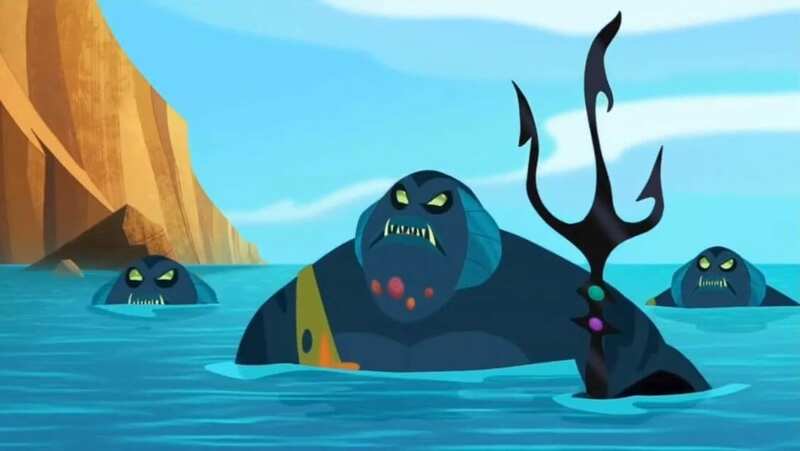 Lance and Shorty are also dead weight in “There’s Something About Hookfoot,” simply making unfunny jokes, aside from one part where Shorty frees everyone from the mermen’s trap. Pascal has a funny moment with a guitar, but otherwise, he and Maximus may as well not be there. In this episode, they go out of their way to exaggerate how dumb, ugly and unhygienic Hookfoot is. It’s not particularly funny, so I can’t help wondering what the point is, other than to maybe contrast it with Serafina’s view and treatment of him. The relationship between Serafina and Hookfoot is under-developed and short-lived, but it’s definitely the highlight of the episode. Although they don’t know each other very well and we don’t learn much about Serafina, their exchanges are genuinely sweet when none of the other characters are around. “There’s Something About Hookfoot” surprised me by ending on a sad note, with Serafina turning out to be a criminal and being apprehended. This results in one scene that is genuinely good and emotional, in which Hookfoot tells Rapunzel that sometimes you have to let the person you love go. The tide comes in, revealing thousands of “mermaid tear” stones along the beach, which Hookfoot follows, walking off into the sunset. I can’t believe they 1) gave the episode a bittersweet ending, and 2) achieved some genuine emotion here. It’s beautiful, too; when the shining stones surface, it looks amazing. It’s such a shame that this great ending was tacked onto an episode that otherwise has very little going for it. Overall, I enjoyed “There’s Something About Hookfoot” more so than some of the worst Rapunzel’s Tangled Adventure/Tangled: The Series episodes, but it’s still not very good. There’s a glimmer of creativity and sincerity when Hookfoot and Serafina are alone together, and the last scene is genuinely heartbreaking. I even appreciate that this episode begins with a narration, like the first movie and the short film Tangled Ever After. But anything involving comedy, the main characters and singing is horrible. This is also yet another episode that has nothing to do with Rapunzel’s destiny and quest introduced in “Outside the Corona Walls.” The writers set that up as being the narrative path for this season, but they’re largely ignoring it. I probably wouldn’t recommend this episode, unless you just really love the characters or you’re willing to tolerate 20 minutes of nonsense for 2 minutes of sincerity. Rapunzel's Tangled Adventure - "There's Something About Hookfoot"
Overall, I enjoyed “There’s Something About Hookfoot” more so than some of the worst Rapunzel’s Tangled Adventure/Tangled: The Series episodes, but it’s still not very good. There’s a glimmer of creativity and sincerity when Hookfoot and Serafina are alone together, and the last scene is genuinely heartbreaking. I even appreciate that this episode begins with a narration, like the first movie and the short film Tangled Ever After. But anything involving comedy, the main characters and singing is horrible.